Place the Pediment beside the play area. Randomly choose one of the sides to lay face-up. 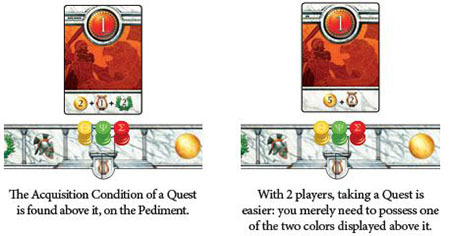 Place the 4 Quests with the .../.... mark below the Pediment, in ascending order from left to right (this setup is used for 3 and 4 players). Place all the Gold, Victory Points (VP) and Trigger rings in a common reserve. Place the Steps below the Quests. Place the Epoch marker on - the first space of the Epoch track. Each player takes a player board. Assemble your board in front of you. Give Disc #1 to a random - player. That player is the start player in the first Epoch. Proceeding clockwise, give the other Discs to the other players in ascending order. Put any unused Disc back in the box. Each player takes 4 Gold. Place your Gold on your board. Each player takes one Column of each color. Place your Columns on your board. Put any unused Columns back in the box. Each player takes a number of VP equal to the number on their Disc. The player with Disc #1 takes 1 VP, the player with Disc #2 takes 2 VP and so on. Choose 5 of the 8 available Families. Put the cards from the 3 unused Families back in the box. The set of Families you choose has an impact on the style of play, so we strongly recommend using the following Families for your first game : Athena, Hades, Hephaestus, Poseidon, Zeus. Take the 105 cards of the chosen Families and shuffle them carefully face-down. 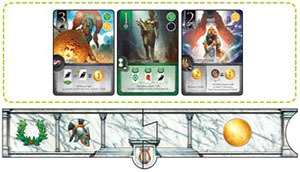 Draw a number of cards equal to 1 plus 3 times the number of players (for example, with 3 players draw 10 cards) and place them face-up in middle of the play area to form the AGORA. Place the remaining cards face-down to form the draw pile. Leave space beside the draw pile for a discard pile. Lay out the 3 Level Bonus tiles and the 10 Family Bonus tiles matching the 5 chosen Families. Let's explore the Greece of Legend! With 2 players, only use the 2 Quests with the mark. Place them so that each Quest is below 2 colors. ere are no other changes to the rules for different numbers of players. If the Apollo Family is in play, then so is the Oracle. Place the Oracle above the Temple. Place 4 face-up cards below the Oracle during setup. If the Ares Family is in play, place all the Prestige Points (PP) in the common reserve. 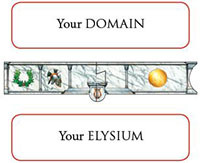 The area above your board is your DOMAIN, and the area below is your ELYSIUM. The back of the cards of all 8 Families show a Citizen. When you "take a Citizen", take the top card from the draw pile and place it face-down in your DOMAIN. This card is now a Citizen for the rest of the game. A Citizen will never be turned over, and no player may look at that card's face-up side. Some cards have the ELEUSIS symbol and are called Eleusis cards. These cards combine with other Eleusis cards to generate powers. The goal of the game is to earn as many Victory Points (VP) as possible. 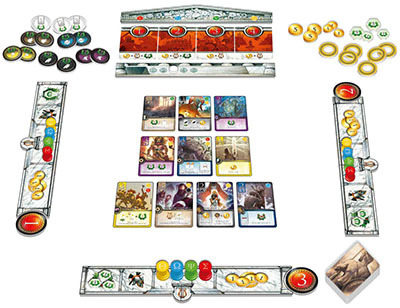 Victory Points are won mostly with the Legends players will write, using the cards they transfer to their ELYSIUM, and also throughout the game using the power of specific cards. Remove from the Agora any cards remaining from the previous Epoch and place them face-up in the discard pile beside the draw pile. with 4 players, 13 cards. Skip step 1 and 2 in the first Epoch. After step 2, add 4 new cards face-up from the draw pile to the Oracle. The Oracle therefore allows players to see some of the cards that will be available in the next Epoch. The player with Disc #1 goes first. Play then continues following the ascending numbers on the players' Discs. On your turn, you must take either 1 Quest tile or 1 Family card. During your 4 turns, you must take exactly 1 Quest and 3 cards. 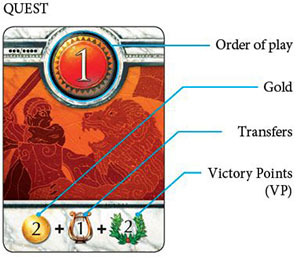 To take a Quest or a Family card, you must have on your board the Column(s) matching the Acquisition Condition. Note: It is forbidden for any player to have two identical cards (with the same illustration) in their domain. Once you've taken a card or a Quest, you must dismiss one (and only one) of your Columns by removing it from your board. You can dismiss any Column, not necessarily one shown on the Acquisition Condition. Note: No matter what the Acquisition Condition of a card may be, you only ever dismiss 1 single Column of a color of your choice. When you take your Quest, place it beside your board. When you take a card, immediately place it in your domain. If you can't fulfill the Acquisition Condition of any remaining Family card, you must instead take a Citizen. Take the top card from the draw pile and place it face-down in your domain. Note: You can't take a Citizen if you are still able to take a Family card, or if you have not taken a Quest but are still able to do so. If you can't fulfill the Acquisition Condition of any remaining Quest, you do not take a Quest during this Epoch. Instead, after you have taken your 3 cards, you must pass your turn. Once all players have completed their turns, you receive one of the remaining Quests, but must flip it to its Incomplete Quest side. During your turn, you may use the powers of the cards in your domain. You cant use the power of a card that you have transferred to your Elysium. You may use the powers of multiple cards in your domain during a single turn. You cant use the Trigger, Activate and Eleusis powers of your cards during another player's turn. If you use a power to transfer a card, you must follow the Rules of Legends. The power of each card can only be used in a specific way, shown by the card's activation symbol. The powers available during Phase III are explained later. The power must be used at the exact moment you take the card (and only then). The power can be used once during every Epoch, as long as the card is in your domain. Turn the card 90° when you use its power. During the next End of Epoch Phase, straighten it up. The power will be available again during the following Epoch. You may only activate an Eleusis card if you have at least 1 other Eleusis card in your domain. If not, you can't use the power of the card. The power is always active, as long as the card is in your domain. The power can be used once during the game, as long as the card is in your domain. When you take a Trigger card, immediately place a Trigger ring on its activation symbol. When you decide to use the power, remove the Trigger ring and return it to the common reserve. If a player uses the power on an Athena card that allows other players to transfer cards, the current player has the opportunity to transfer a card first, and then all other players may transfer a card in current player order. If the power of any card creates a conflict with the general rules, the specific power of that card takes precedence. This is true for all card powers in the game. Once all players have completed their turns in Phase II, the Epoch continues with Phase III: Writing the Legends. In this phase, you allocate the turn order for the next Epoch, receive VP and Gold for your Quest, and can then transfer cards from your domain into your Elysium and so create and complete your Legends, which will earn you most of your victory points at the end of the game. First, reallocate the Discs according to the Quests taken by the players in Phase II. The player with Quest #1 receives Disc #1, and so on. A player with an Incomplete Quest automatically gets the Disc with the highest number. If there are multiple players with Incomplete Quests, their current Discs are used to break the tie. Example: In the current Epoch of a 4-player game, Sebastian has Disc #1 and Christopher has Disc #3. Both of these players took Incomplete Quests. When the Discs are reallocated, Sebastian receives Disc #3 and Christopher receives Disc #4. All players receive the VP and Gold shown on their Quest. Finally, following the new order of play determined by the Discs, each player may transfer cards from their domain to their Elysium. The number of cards you can transfer is limited to the number shown in the Lyre symbol on your Quest. Every transfer costs Gold. The cost to transfer any card is equal to its Level (1, 2, or 3). Return any Gold spent to the common reserve. 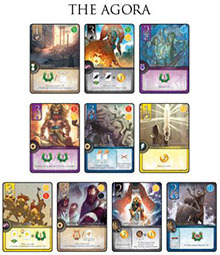 Every card transferred into your Elysium must follow the Rules of Legends explained on the opposite page. Place all the Quest tiles back in the Temple, face up below the Pediment, in ascending order from left to right. The power can be used during Phase III, as long as the card is in your domain. Some permanent powers can also be used during Phase III, as long as the card is in your domain. Every transfer costs Gold equal to the Level of the card, and moves the card from your domain to your Elysium. Every time you transfer a card you must choose whether to start writing a new Legend, or to add the card to an existing Legend, possibly completing it. There are two kinds of Legends: Level Legends and Family Legends. Level Legends can only include cards of the same Level, but of different Families. A Level Legend is made of a maximum of 5 cards, one from each of the Families. Family Legends can only include cards of same Family, but of different Levels. A Family Legend is made up of a maximum of 3 cards, one of each of the Levels. You can add cards to individual Legends in any order. You could start a Family Legend with a Level 2 card, then add a Level 1 card, and finally complete it with a Level 3 card. You may have any number of incomplete Legends at any time. You do not need to complete one before starting another. Once added to a Legend, a card can never be moved to a different Legend or discarded. A single card in your Elysium can never be added to another incomplete Legend later. You may transfer a card with a Trigger ring. If you do, return the ring to the common reserve. Single cards in your Elysium at the end of the game will be removed and are not worth any victory points. A Citizen can also be transferred into your Elysium and added to a Legend, but only when that Legend already contains at least 2 cards. The Citizen takes the place of one Family card missing from that Legend. The cost in Gold to transfer a Citizen is always equal to the Level of the missing card. Citizens are therefore a form of 'joker'. But be careful: There is a price to be paid! 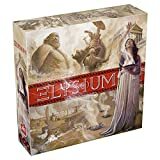 Each Citizen in your Elysium at the end of the game will cost you 2 VP. The first player to complete a Family Legend gets the matching Bonus tile worth 5 VP. The second player to complete a Legend of the same Family gets the matching Bonus tile worth 2 VP. Subsequent players get nothing. It is possible to get both Bonus tiles if you complete two Legends of that Family before any other player completes one. For each Level Legend, the first player to write a Legend of at least 2 cards gets the matching Bonus tile. If another player writes a Legend of the same Level containing more cards than the player with the matching Bonus tile, that player steals the Bonus. Each Level Legend Bonus tile can therefore change owners multiple times, unless a player completes a matching Level Legend with 5 cards, which is impossible to beat. Place your 4 Columns back on your board. Straighten up any Activate cards in your domain. Move the Epoch marker one space along the Epoch track. Begin the next Epoch with Phase I: Awakening. The game ends at the end of the fifth Epoch. When this happens, continue with final scoring. Start by removing from the game all cards in players' domains, and all single cards in players' Elysiums (only Legends that contain at least 2 cards are worth VP). Do not put these cards in the discard pile. Instead, remove them from the game. This is when you can use these powers to gain bonus victory points. Chronos cards must be in a Legend to score victory points. The equal and 'not equal' symbols remind you of the optimal use of the power: in a Family Legend or Level Legend, respectively. The player with the most PP scores 16 VP. The next player scores 8 VP, then 4 VP, then 2 VP. In case of a tie, share the cumulative VP of the tied players positions. Important: A player with no PP scores no extra VP! Add all the points scored from your Chronos powers, Legends and PP to the VP you gained during the game. Finally, you must discard 2 VP for each Citizen in your Legends. Then compare your final scores. The player with the highest score wins. In case of a tie, the player who has the most Gold remaining among the tied players wins. If there is still a tie, the tied players' share a victory. Once you've played a few games, we suggest you try different Family sets. 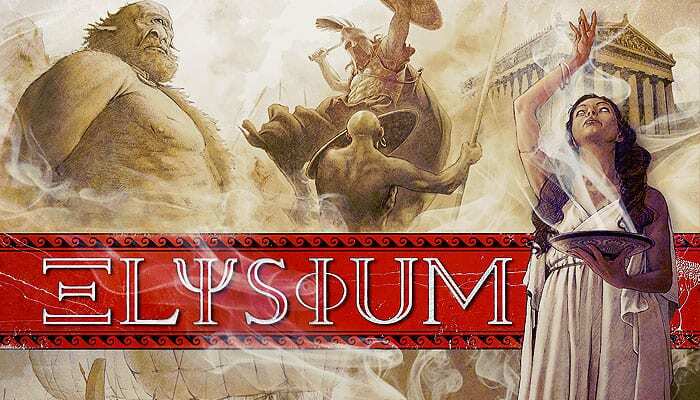 Each game of Elysium is different, even if you play with the same families of Gods. However, it would be a pity to not vary the fun, as the powers of the cards are quite different and deeply change the feel of the game. Thus, we are presenting you some family "sets", which we've particularly enjoyed or which create a special play environment. After multiple games, you'll know which ones suit you the best, and will be able to create your own sets! Don't hesitate to tell us about them on the Space Cowboys webpage dedicated to Elysium. The "Opulence" set, for those who like high scores: Ares, Athena, Hephaestus, Hermes, Zeus. The "Misfortune befalls the vanquished" set, for those who like aggressive interaction and fierce competition: Ares, Hades, Hephaestus, Hermes, Poseidon. 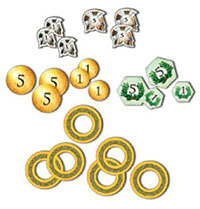 The "Wasteland" set, for players who like difficulty and tight scores: Apollo, Ares, Hades, Hermes, Poseidon. The "Deadly plots" set, for those who like spectacular combos: Apollo, Athena, Hades, Hephaestus, Hermes. The "Why bother with Elysium?" set, for players who like to find alternate ways to win: Apollo, Ares, Athena, Poseidon, Zeus. When you take a card or a Quest, you must discard one Column (and only one) from among those still remaining on your board. You can dismiss any Column, not necessarily one shown on the Acquisition Condition. You can't have two or more identical cards (with the same artwork) in your Domain. Every time you transfer a card, you must pay for it! A transfer costs Gold equal to the Level of the card. You can only transfer a Citizen to your Elysium if you can add it to a Legend already containing at least two cards. You can't use a power during another player's turn. If you don't have any prestige points (PP), Ares doesn't give you any VP. A card in your Domain may be affected by its own power. For example, a Hermes card which gives 1 Gold when you transfer a Hermes card will give you 1 Gold if you transfer the card itself! If you are able to take a card or a Quest, you can't choose to take a Citizen. You only take an Incomplete Quest after all players have completed their turns. Always reallocate the order of play Discs at the BEGINNING of the Writing of Legends Phase. It may be important for gaining or keeping Level or Family Bonuses. A single card in your Elysium is removed at the end of the game, and is not worth any victory points.